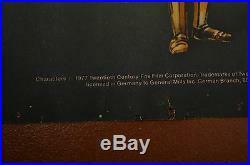 D eutsches original ” Star Wars Super-Poster im Panoramaformat 119 x 168cm ” von General Mills Inc. Aus dem Jahr 1977. Star Wars – German original “Star Wars Super-Poster” from General Mills Inc. Original General Mills Poster von 1977. Ich erinnere mich daran, als Kind 1977 im Spielwarengeschäft vor einem solchen Poster gestanden zu haben. Poster ist zweiteilig gedruckt und in der Mitte auf der Rückseite mit Klebeband zusammen geklebt. Größe: 2 x Din A0 (zusammen 119 x 168 cm). Eine EXTREM seltene Rarität. Kaum noch zu finden – egal in welchem Zustand. Ein MUSS für jeden echten Star Wars Fan und Poster-Sammler. Aber auch eine Verantwortung, dafür zu sorgen, dass dieses Poster für kommende Generationen überlebt. I remember standing in front of one of these posters as a kid 1977 in a toy store. Printed in 2 sections designed to overlap, measures 46 3/4″ x 66″ with the two sections combined as intended. Huge Size: 46 3/4″ x 66″. This is a EXTREMELY RARE Poster. Very hard to find in any condition. A true piece of Star Wars history. A MUST-HAVE for every serious Star Wars fan and movie poster collector. But also the responsibility to make sure this poster will survive for generations to come. Risse, mit inzwischen sehr altem Tesa-Film geklebt. Rechte Bildhälfte vergilbter als linke Hälfte. Bildhälften auf der Rückseite mit Klebeband geklebt. Some tears taped very long ago. Right section looks more aged than left section. For details see pictures. Ein echtes Original -Plakat von 1977. It’s an original authentic vintage poster. Wertsteigerung: Ein original Filmposter ist eine Investition, die keiner Inflation unterliegt. Jeden Tag und jedes Jahr überleben weniger Originale. Es wird immer seltener und wächst ständig im Wert mit der Zeit. JETZT ist das Poster vermutlich schon weniger wert als JETZT. I ncrease in value: An original movie poster is an investment that is uneffected by inflation. Each day and year by year fewer of the originals survive. They are getting rarer and increase in value as time goes by. NOW this poster is propably more valuable than NOW. And NOW it’s even more valuable than at the start of this sentence. Ich sammle Filmposter aus Leidenschaft. Es müssen originale Filmposter sein – aus der Zeit, in der der jeweilige Film im Kino lief. Keine Nachdrucke, keine Fälschungen. Es reizt mich bei einem Film-Poster, dieses echte Stück Filmgeschichte vor mir zu haben, vor dem tausende Menschen mit großen Augen staunend stehenblieben und dachten:’Wow! Den Film will ich unbedingt sehen! Dieses Objekt der Begierde zu besitzen, das sich so viele Menschen vor mir angesehen haben und das sie dazu gebracht hat, ihr Geld ins Kino zu tragen, welches dann in die Filmstudios geflossen ist und dort neue Filme finanziert hat, ist einfach wunderbar! Aber da denkt mancher Sammler anders. So kommt es, dass ich manche Poster erneut kaufe, obwohl ich sie vielleicht bereits in besserem Zustand besitze. Erst kaufe ich es, weil ich es überhaupt irgendwo finde und dann kaufe ich es manchmal erneut, weil ich dem gerade entdeckten Poster seine Geschichte noch mehr ansehe. Da ich nur eines davon aufhänge, und ich die Verantwortung trage, dafür zu sorgen, dass dieses Stück Filmgeschichte auch der Nachwelt erhalten bleibt, verkaufe ich meine übrigen (qualitativ oft besseren) Exemplare. It’s my passion to collect authentic original theatrical movie posters. They have to be originals from the year the movie was shown in theaters. No reprints, no bootlegs. I love to have those authentic pieces of film history in front of me. People on the street saw it, stopped and thought:’Wow! I want to watch this movie! Personally I like the ones most that show their history on them like pinholes and wear from being displayed by movie theatre empoyees. Then I find another one that shows more of its history on it. Since I display only one of them and I have the responsibility to make sure the poster is kept well for later generations, I sell the other ones. Wenn Sie Fragen zu dem Artikel haben, fragen Sie mich bitte, bevor Sie bieten oder kaufen. Dies ist ein Privatverkauf. Rückgabe und Gewährleistung möchte ich daher ausschließen. Für Versand ins Ausland möglicherweise anfallende Zollgebühren und/oder Steuern sind nicht im Preis enthalten. This is a private sale. Schauen Sie sich auch meine übrigen Artikel. Take a look at my other items. The item “ORIGINAL 1977 vintage General Mills STAR WARS SUPER-POSTER from Toy Stores RARE” is in sale since Wednesday, January 9, 2019. 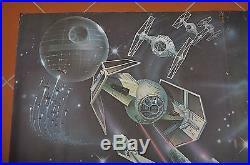 This item is in the category “Sammeln & Seltenes\Science-Fiction\Star Wars\Poster & Bilder”. The seller is “realelhi” and is located in Hamburg. This item can be shipped worldwide. ToPortraits Studio – Original Oil Paintings and Painting Reproductions. Abstract / Modern Art. >> Shop All Original Art. >> Shop All Reproductions. >> Shop All Artists. About Photo to Painting. Title : General Grievous Oil Painting. Artist : ToPortraits – Original. Size : 36″ x 30″ (91cm x 76cm). Medium : Oil on Canvas. Signature : No – Available Upon Request. Frame : Unframed (rolled inside a tube). Availability : Made To Order. Processing Time : 14-21 Days. Decorate your home today with a timeless masterpiece from our collection of brilliant oil paintings produced by our team of remarkably talented artists. Our paintings are completely hand-painted in our own studio using only superior quality oil paints, brushes and canvases, ensuring us to confidently vouch for the durability and timeless quality of our artwork. Our fine art pieces will not only add grandeur to your home décor but also help distinctly convey your artistic taste. Our sole endeavor is to produce original artworks of superior quality and appeal so that you can proudly allow it to decorate the walls of your home. At ToPortraits, we do not resort to digital methods and printing techniques to produce paintings. Our paintings are always hand-made in our own studio by a skilled group of artists who follow every quality standard and intricate procedure required to create a masterpiece. IMPORTANT NOTE: Since each oil painting is entirely hand-painted by an individual artist, one can expect some minor variations in the actual oil painting you receive and the picture sown on the listing page. At that time, our artists will make any changes you wish to the oil painting at no extra charge. Your 100% satisfaction is our #1 priority! 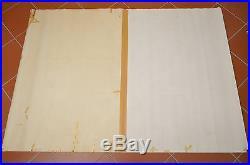 The painted canvas you will receive is 36 inches wide and 30 inches tall (91cm x 76cm) + an additional 2 inches of canvas on each side for stretching/framing purposes. Since each oil painting is individually commissioned, we can be very flexible to meet your needs. While we only display standard sizes, you may order any size that you wish. We use the best carriers in the business to make sure your order gets to you on time. However, please bear in mind that certain paintings requiring a highly complex production or large framed pieces may take slightly more time to complete. To know about the availability of an item, please refer to the Details section of the listing page. ToPortraits is committed to quality products and your satisfaction is 100% guaranteed! All we ask is that you send the items back to us in the original packaging, and make sure that the merchandise is in the same condition. You have nothing to chance or lose. Policy for further information. We have tried to answer any question you may have. Our Most Frequently Asked Questions. Our extensive collection of frames makes it easy for you to own a museum quality painting that suits both, your taste and budget. We offer framing options based solely for the purpose of preserving and heightening the beauty of your precious masterpieces. High-quality framing calls for skill, precision and mastery over the intricate art of frame-making, qualities our team of expert framers possess. Can’t Find What You’re Looking For? We offer customized painting solutions; our artists can paint anything you want, even images that are not offered in our catalogue. All you need to do is to send us a photograph of the artwork you desire and we will make an immaculate reproduction of the same. Just tell us what you need and well make it happen. ToPortraits first began in 2001 as a small art studio in Xiamen, China. Over the past decade and more, we have grown manifold to become one of the largest global manufacturers and distributors of hand-made art. Today, we have operations in the United Kingdom, China and Israel and distribution channels in USA, Canada, Europe and Southeast Asia. Not only do we cater to galleries, retailers, interior designers, corporates, private collectors and art dealers but help individuals across the world beautify their homes, apartments and offices with our artworks. The answer is simple. Whether you want a hand-made reproduction of an amazing piece of art, a one of a kind original artwork, or if you’re looking to turn a photograph into an original work of art, ToPortraits is the best, most affordable gallery in the world. In addition to our large selection of paintings, we have a commitment to excellence in everything we do. We take great pride not only in the quality of our artwork and our competitive prices, but also in our top-notch customer service. We want you to know that you can always count on us to give you the best service at the lowest price available. With us, you can even get a painting for a price that some of our competitors charge for a print! ToPortraits specializes in converting a digital image or photograph into a handmade masterpiece. Our artists can turn any image-ranging from your portrait, family pictures, your first car to your vacation pictures, to a spectacular artwork. Since our artists start working from scratch on a blank canvas, their creative efforts are limitless. With the help of our artists, your favorite photo can turn into a unique masterpiece, worthy of being regarded as a heirloom, yet at an incredibly low price. We also cater to special requests, with regard to your original pictures. Whether you want us to combine two or more images from separate photos, add or delete any figure or object, incorporate a different background, add color to an otherwise black and white portrait or recreate a brand new painting from an old and damaged image, we will deliver your request with ease. Just name it and well do it; with us, the possibilities are endless. ToPortraits is your one stop source for exquisite oil painting reproductions. We can recreate every major work by every important artist who ever held a brush to canvas. Every oil painting we produce is completely hand painted by our gifted artists in the same time-honored traditions utilized by the world’s most renowned artists, emphasizing the importance of aesthetics, technique and style. We pride ourselves on being the premier source for the finest oil painting reproductions at truly affordable prices. We promise that you will be absolutely thrilled with our oil painting reproductions and invite you to browse our extensive collection of paintings that will sure to satisfy the most discerning tastes. ToPortraits gladly accepts wholesale orders. We are insisting on our company principle “Best Service and Highest Quality”, and willing to build mutual benefits and long term business relationships with all customers, large or small in the same professional manner. Any artwork you find on our store is qualified for wholesale order discount, no starting price limit. ToPortraits promotes partnerships and provides various ways to enable a profitable relationship. For over 10 years we’ve provided a full range of art services to businesses, individuals, and the design community. No matter what your space, style, or budget requires, we promise a creative and affordable solution that will exceed your expectations. Whatever your art needs – whether for a few select pieces, a new painting for your office or art on a grand scale – we have the knowledge, experience, and resources to fulfill your requirements quickly, creatively and cost-effectively. If you would like to have a test order, we would love to hear from you. We take great pride in providing our customers with world-class service. Our specialized agents are very knowledgeable about our assortment and provide a level of service that you’d typically only find through high-end galleries. Every step of the way you can contact our support professionals — whether you’re inquiring about choosing the right painting, checking the status of an order or requesting a change. 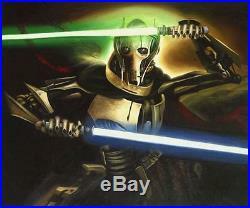 The item “General Grievous, Star Wars Original Hand Painted Movie Poster Oil Painting XL” is in sale since Monday, June 15, 2015. This item is in the category “Art\Paintings”. The seller is “toportraits-studio” and is located in Xiamen. This item can be shipped worldwide. D eutsches original ” Star Wars Super-Poster im Panoramaformat 119 x 168cm ” von General Mills Inc. Aus dem Jahr 1977. Star Wars – German original “Star Wars Super-Poster” from General Mills Inc. Original General Mills Poster von 1977. Ich erinnere mich daran, als Kind 1977 im Spielwarengeschäft vor einem solchen Poster gestanden zu haben. Poster ist zweiteilig gedruckt und in der Mitte auf der Rückseite mit Klebeband zusammen geklebt. Größe: 2 x Din A0 (zusammen 119 x 168 cm). Eine EXTREM seltene Rarität. Kaum noch zu finden – egal in welchem Zustand. Ein MUSS für jeden echten Star Wars Fan und Poster-Sammler. Aber auch eine Verantwortung, dafür zu sorgen, dass dieses Poster für kommende Generationen überlebt. I remember standing in front of one of these posters as a kid 1977 in a toy store. Printed in 2 sections designed to overlap, measures 46 3/4″ x 66″ with the two sections combined as intended. Huge Size: 46 3/4″ x 66″. This is a EXTREMELY RARE Poster. Very hard to find in any condition. A true piece of Star Wars history. A MUST-HAVE for every serious Star Wars fan and movie poster collector. But also the responsibility to make sure this poster will survive for generations to come. Risse, mit inzwischen sehr altem Tesa-Film geklebt. Rechte Bildhälfte vergilbter als linke Hälfte. Bildhälften auf der Rückseite mit Klebeband geklebt. Some tears taped very long ago. Right section looks more aged than left section. For details see pictures. Ein echtes Original -Plakat von 1977. It’s an original authentic vintage poster. Wertsteigerung: Ein original Filmposter ist eine Investition, die keiner Inflation unterliegt. Jeden Tag und jedes Jahr überleben weniger Originale. Es wird immer seltener und wächst ständig im Wert mit der Zeit. JETZT ist das Poster vermutlich schon weniger wert als JETZT. I ncrease in value: An original movie poster is an investment that is uneffected by inflation. Each day and year by year fewer of the originals survive. They are getting rarer and increase in value as time goes by. NOW this poster is propably more valuable than NOW. And NOW it’s even more valuable than at the start of this sentence. Ich sammle Filmposter aus Leidenschaft. Es müssen originale Filmposter sein – aus der Zeit, in der der jeweilige Film im Kino lief. Keine Nachdrucke, keine Fälschungen. Es reizt mich bei einem Film-Poster, dieses echte Stück Filmgeschichte vor mir zu haben, vor dem tausende Menschen mit großen Augen staunend stehenblieben und dachten:’Wow! Den Film will ich unbedingt sehen! Dieses Objekt der Begierde zu besitzen, das sich so viele Menschen vor mir angesehen haben und das sie dazu gebracht hat, ihr Geld ins Kino zu tragen, welches dann in die Filmstudios geflossen ist und dort neue Filme finanziert hat, ist einfach wunderbar! Aber da denkt mancher Sammler anders. So kommt es, dass ich manche Poster erneut kaufe, obwohl ich sie vielleicht bereits in besserem Zustand besitze. Erst kaufe ich es, weil ich es überhaupt irgendwo finde und dann kaufe ich es manchmal erneut, weil ich dem gerade entdeckten Poster seine Geschichte noch mehr ansehe. Da ich nur eines davon aufhänge, und ich die Verantwortung trage, dafür zu sorgen, dass dieses Stück Filmgeschichte auch der Nachwelt erhalten bleibt, verkaufe ich meine übrigen (qualitativ oft besseren) Exemplare. It’s my passion to collect authentic original theatrical movie posters. They have to be originals from the year the movie was shown in theaters. No reprints, no bootlegs. I love to have those authentic pieces of film history in front of me. People on the street saw it, stopped and thought:’Wow! I want to watch this movie! Personally I like the ones most that show their history on them like pinholes and wear from being displayed by movie theatre empoyees. Then I find another one that shows more of its history on it. Since I display only one of them and I have the responsibility to make sure the poster is kept well for later generations, I sell the other ones. Wenn Sie Fragen zu dem Artikel haben, fragen Sie mich bitte, bevor Sie bieten oder kaufen. Dies ist ein Privatverkauf. Rückgabe und Gewährleistung möchte ich daher ausschließen. Für Versand ins Ausland möglicherweise anfallende Zollgebühren und/oder Steuern sind nicht im Preis enthalten. This is a private sale. Schauen Sie sich auch meine übrigen Artikel. Take a look at my other items. 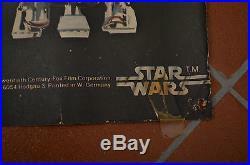 The item “ORIGINAL 1977 vintage General Mills STAR WARS SUPER-POSTER from Toy Stores RARE” is in sale since Sunday, August 26, 2018. 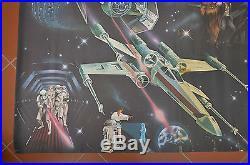 This item is in the category “Sammeln & Seltenes\Science-Fiction\Star Wars\Poster & Bilder”. The seller is “realelhi” and is located in Hamburg. This item can be shipped worldwide. 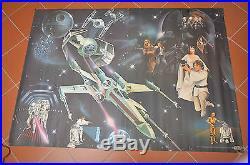 D eutsches original ” Star Wars Super-Poster im Panoramaformat 119 x 168cm ” von General Mills Inc. Aus dem Jahr 1977. Star Wars – German original “Star Wars Super-Poster” from General Mills Inc. Original General Mills Poster von 1977. Ich erinnere mich daran, als Kind 1977 im Spielwarengeschäft vor einem solchen Poster gestanden zu haben. Poster ist zweiteilig gedruckt und in der Mitte auf der Rückseite mit Klebeband zusammen geklebt. Größe: 2 x Din A0 (zusammen 119 x 168 cm). Eine EXTREM seltene Rarität. Kaum noch zu finden – egal in welchem Zustand. Ein MUSS für jeden echten Star Wars Fan und Poster-Sammler. Aber auch eine Verantwortung, dafür zu sorgen, dass dieses Poster für kommende Generationen überlebt. I remember standing in front of one of these posters as a kid 1977 in a toy store. Printed in 2 sections designed to overlap, measures 46 3/4″ x 66″ with the two sections combined as intended. Huge Size: 46 3/4″ x 66″. This is a EXTREMELY RARE Poster. Very hard to find in any condition. A true piece of Star Wars history. A MUST-HAVE for every serious Star Wars fan and movie poster collector. But also the responsibility to make sure this poster will survive for generations to come. Risse, mit inzwischen sehr altem Tesa-Film geklebt. Rechte Bildhälfte vergilbter als linke Hälfte. Bildhälften auf der Rückseite mit Klebeband geklebt. Some tears taped very long ago. Right section looks more aged than left section. For details see pictures. Ein echtes Original -Plakat von 1977. It’s an original authentic vintage poster. Wertsteigerung: Ein original Filmposter ist eine Investition, die keiner Inflation unterliegt. Jeden Tag und jedes Jahr überleben weniger Originale. Es wird immer seltener und wächst ständig im Wert mit der Zeit. JETZT ist das Poster vermutlich schon weniger wert als JETZT. I ncrease in value: An original movie poster is an investment that is uneffected by inflation. Each day and year by year fewer of the originals survive. They are getting rarer and increase in value as time goes by. NOW this poster is propably more valuable than NOW. And NOW it’s even more valuable than at the start of this sentence. Ich sammle Filmposter aus Leidenschaft. Es müssen originale Filmposter sein – aus der Zeit, in der der jeweilige Film im Kino lief. Keine Nachdrucke, keine Fälschungen. Es reizt mich bei einem Film-Poster, dieses echte Stück Filmgeschichte vor mir zu haben, vor dem tausende Menschen mit großen Augen staunend stehenblieben und dachten:’Wow! Den Film will ich unbedingt sehen! Dieses Objekt der Begierde zu besitzen, das sich so viele Menschen vor mir angesehen haben und das sie dazu gebracht hat, ihr Geld ins Kino zu tragen, welches dann in die Filmstudios geflossen ist und dort neue Filme finanziert hat, ist einfach wunderbar! Aber da denkt mancher Sammler anders. So kommt es, dass ich manche Poster erneut kaufe, obwohl ich sie vielleicht bereits in besserem Zustand besitze. Erst kaufe ich es, weil ich es überhaupt irgendwo finde und dann kaufe ich es manchmal erneut, weil ich dem gerade entdeckten Poster seine Geschichte noch mehr ansehe. Da ich nur eines davon aufhänge, und ich die Verantwortung trage, dafür zu sorgen, dass dieses Stück Filmgeschichte auch der Nachwelt erhalten bleibt, verkaufe ich meine übrigen (qualitativ oft besseren) Exemplare. It’s my passion to collect authentic original theatrical movie posters. They have to be originals from the year the movie was shown in theaters. No reprints, no bootlegs. I love to have those authentic pieces of film history in front of me. People on the street saw it, stopped and thought:’Wow! I want to watch this movie! Personally I like the ones most that show their history on them like pinholes and wear from being displayed by movie theatre empoyees. Then I find another one that shows more of its history on it. Since I display only one of them and I have the responsibility to make sure the poster is kept well for later generations, I sell the other ones. Wenn Sie Fragen zu dem Artikel haben, fragen Sie mich bitte, bevor Sie bieten oder kaufen. Dies ist ein Privatverkauf. Rückgabe und Gewährleistung möchte ich daher ausschließen. Für Versand ins Ausland möglicherweise anfallende Zollgebühren und/oder Steuern sind nicht im Preis enthalten. This is a private sale. Schauen Sie sich auch meine übrigen Artikel. Take a look at my other items. 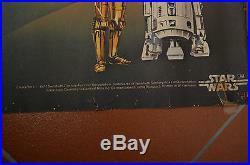 The item “ORIGINAL 1977 vintage General Mills STAR WARS SUPER-POSTER from Toy Stores RARE” is in sale since Wednesday, May 9, 2018. 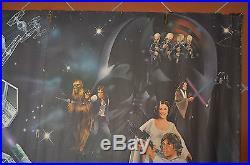 This item is in the category “Sammeln & Seltenes\Science-Fiction\Star Wars\Poster & Bilder”. The seller is “realelhi” and is located in Hamburg. This item can be shipped worldwide. 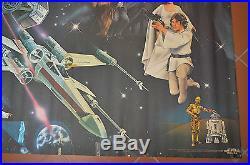 D eutsches original ” Star Wars Super-Poster im Panoramaformat 119 x 168cm ” von General Mills Inc. Aus dem Jahr 1977. Star Wars – German original “Star Wars Super-Poster” from General Mills Inc. Original General Mills Poster von 1977. Ich erinnere mich daran, als Kind 1977 im Spielwarengeschäft vor einem solchen Poster gestanden zu haben. Poster ist zweiteilig gedruckt und in der Mitte auf der Rückseite mit Klebeband zusammen geklebt. Größe: 2 x Din A0 (zusammen 119 x 168 cm). Eine EXTREM seltene Rarität. Kaum noch zu finden – egal in welchem Zustand. Ein MUSS für jeden echten Star Wars Fan und Poster-Sammler. Aber auch eine Verantwortung, dafür zu sorgen, dass dieses Poster für kommende Generationen überlebt. I remember standing in front of one of these posters as a kid 1977 in a toy store. Printed in 2 sections designed to overlap, measures 46 3/4″ x 66″ with the two sections combined as intended. Huge Size: 46 3/4″ x 66″. This is a EXTREMELY RARE Poster. Very hard to find in any condition. A true piece of Star Wars history. A MUST-HAVE for every serious Star Wars fan and movie poster collector. But also the responsibility to make sure this poster will survive for generations to come. Risse, mit inzwischen sehr altem Tesa-Film geklebt. Rechte Bildhälfte vergilbter als linke Hälfte. Bildhälften auf der Rückseite mit Klebeband geklebt. Some tears taped very long ago. Right section looks more aged than left section. For details see pictures. Ein echtes Original -Plakat von 1977. It’s an original authentic vintage poster. Wertsteigerung: Ein original Filmposter ist eine Investition, die keiner Inflation unterliegt. Jeden Tag und jedes Jahr überleben weniger Originale. Es wird immer seltener und wächst ständig im Wert mit der Zeit. JETZT ist das Poster vermutlich schon weniger wert als JETZT. I ncrease in value: An original movie poster is an investment that is uneffected by inflation. Each day and year by year fewer of the originals survive. They are getting rarer and increase in value as time goes by. NOW this poster is propably more valuable than NOW. And NOW it’s even more valuable than at the start of this sentence. Ich sammle Filmposter aus Leidenschaft. Es müssen originale Filmposter sein – aus der Zeit, in der der jeweilige Film im Kino lief. Keine Nachdrucke, keine Fälschungen. Es reizt mich bei einem Film-Poster, dieses echte Stück Filmgeschichte vor mir zu haben, vor dem tausende Menschen mit großen Augen staunend stehenblieben und dachten:’Wow! Den Film will ich unbedingt sehen! Dieses Objekt der Begierde zu besitzen, das sich so viele Menschen vor mir angesehen haben und das sie dazu gebracht hat, ihr Geld ins Kino zu tragen, welches dann in die Filmstudios geflossen ist und dort neue Filme finanziert hat, ist einfach wunderbar! Aber da denkt mancher Sammler anders. So kommt es, dass ich manche Poster erneut kaufe, obwohl ich sie vielleicht bereits in besserem Zustand besitze. Erst kaufe ich es, weil ich es überhaupt irgendwo finde und dann kaufe ich es manchmal erneut, weil ich dem gerade entdeckten Poster seine Geschichte noch mehr ansehe. Da ich nur eines davon aufhänge, und ich die Verantwortung trage, dafür zu sorgen, dass dieses Stück Filmgeschichte auch der Nachwelt erhalten bleibt, verkaufe ich meine übrigen (qualitativ oft besseren) Exemplare. It’s my passion to collect authentic original theatrical movie posters. They have to be originals from the year the movie was shown in theaters. No reprints, no bootlegs. I love to have those authentic pieces of film history in front of me. People on the street saw it, stopped and thought:’Wow! I want to watch this movie! Personally I like the ones most that show their history on them like pinholes and wear from being displayed by movie theatre empoyees. Then I find another one that shows more of its history on it. Since I display only one of them and I have the responsibility to make sure the poster is kept well for later generations, I sell the other ones. Wenn Sie Fragen zu dem Artikel haben, fragen Sie mich bitte, bevor Sie bieten oder kaufen. Dies ist ein Privatverkauf. Rückgabe und Gewährleistung möchte ich daher ausschließen. Für Versand ins Ausland möglicherweise anfallende Zollgebühren und/oder Steuern sind nicht im Preis enthalten. This is a private sale. Schauen Sie sich auch meine übrigen Artikel. Take a look at my other items. The item “ORIGINAL 1977 vintage General Mills STAR WARS SUPER-POSTER from Toy Stores RARE” is in sale since Sunday, April 08, 2018. 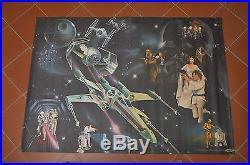 This item is in the category “Sammeln & Seltenes\Science-Fiction\Star Wars\Poster & Bilder”. The seller is “realelhi” and is located in Hamburg. This item can be shipped worldwide.